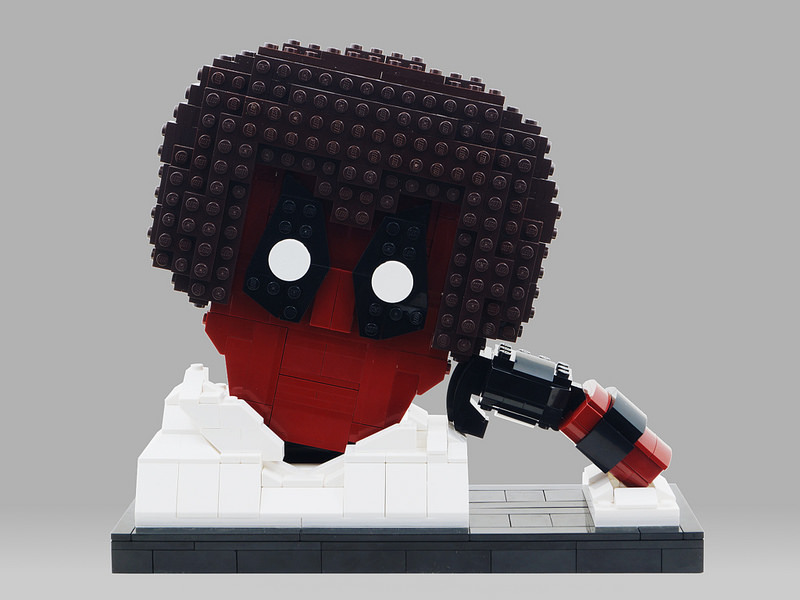 Hey there, yes, you… reading this article on The Brothers Brick or Facebook, or Twitter or– it doesn’t really matter… You probably know me, and how good looking I am, but just in case you don’t, my name is Wade Wilson and my not-so-favourite food that I eat only on alternate Wednesday mornings for breakfast is chimichangas. I wear red because the bad guys dig it. I do have to thank BrickinNick for loving me so much he had me immortalised in a bust of none other than me in my favourite pose when I’m quite hungry or surprised. Pick one, toss a coin, doesn’t matter. 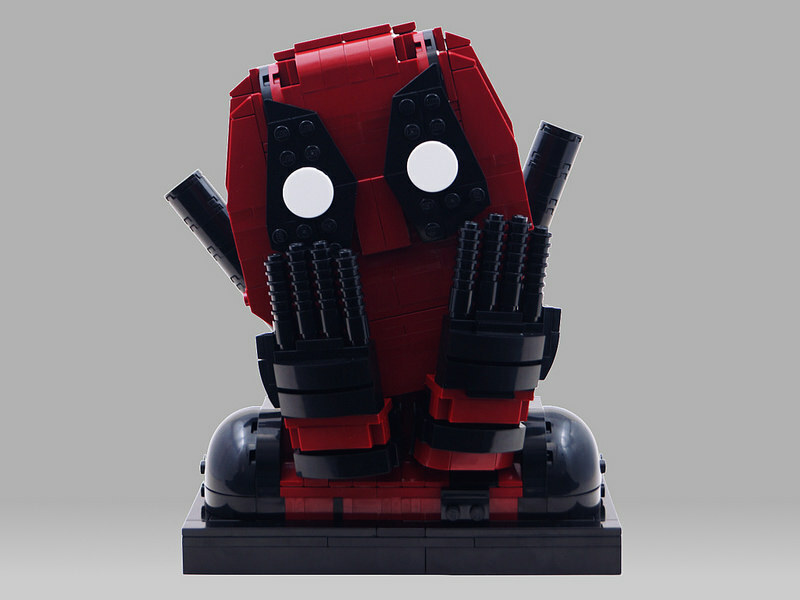 Either way, always remember, with great powers comes great superheroes made of LEGO bricks. Oh, yeah. I love Bob Ross, so here I am, all dressed up for a party, nowhere to go. Give me a call will ya? It’s 1-800-BOB-ROSS. I’m waiting for that call to come in, so do it now, okay? Deadpool Duck or Howard the Deadpool? Miss out on the LEGO San Diego Comic Con Exclusive Mallard with a Mouth that everyone was talking about? 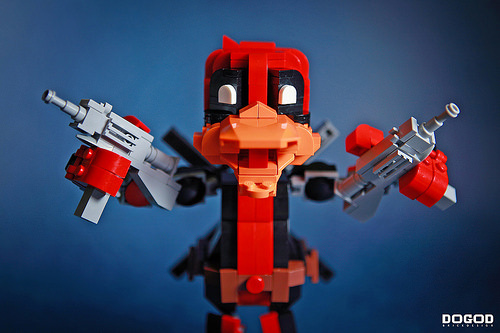 You’ll love this poseable version of Howard the Dead Duckpool – this hilarious contribution by DOGOD Brick Design looks fantastic. Poolduck the Dead Howard is complete with swords on his back, automatic weapons in his hands, a vacant stare in his eyes and a quirky tuft of hair. Whatever you want to call him, there is no doubt this is one sarcastic mother ducker. 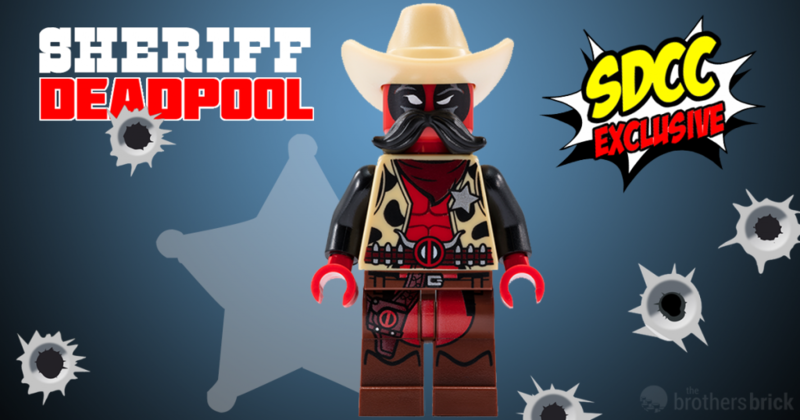 Captain Kittypool! No, just Kittypool. If you even think about bringing government, baby sitters, bedtimes, frowny faces, bushy mustaches, or negativity of any kind into her town then she’s gonna do to your face what Limp Bizkit did to music in the late 90s! 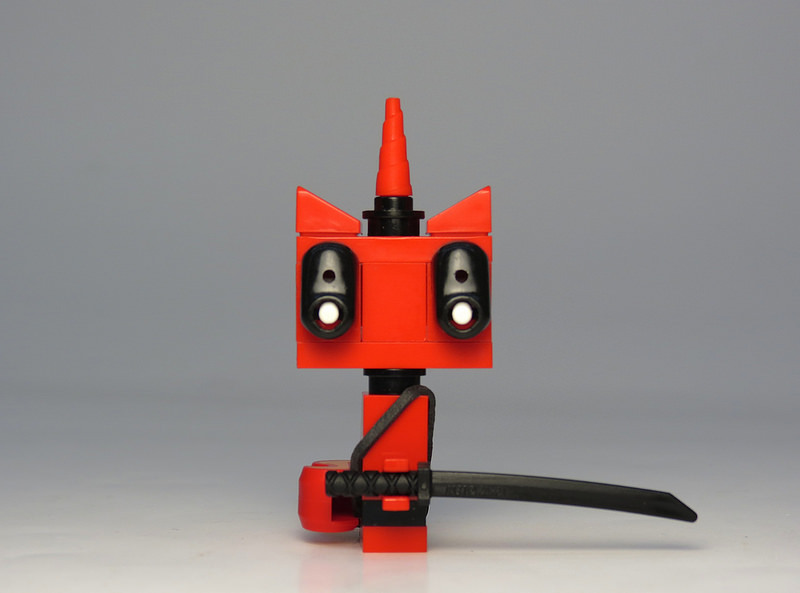 Grantmasters, continuing in his quest to find new and exciting uses for that Belville shoe, created this adorable mash-up of everyone’s favorite brick-built pony-cat and the foul-mouthed antihero that’s currently tearing up the box office. Cotton-candy coated chimichangas anyone? Now I know you’re thinking: “What? Is it Sunday already?” Not exactly. This year, Valentine’s Day came a bit early just for you. The gift? Me, Deadpool. Up on the big screen for the first time today, and this screen for the second time. It’s a lot of me to handle, I understand. 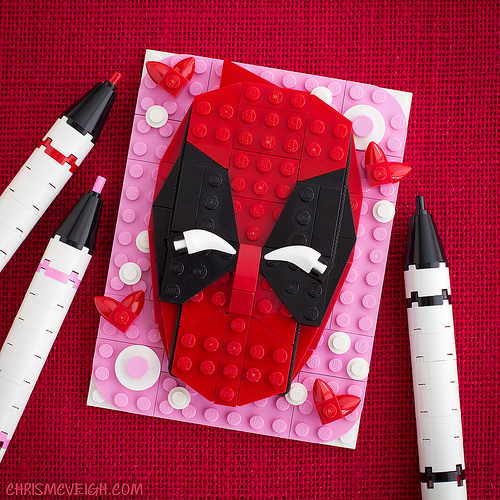 But if you’re not up for my movie, we could just stay here and lie down by the fire …I’ve got chimichangas in the kitchen. Interested? With Deadpool finally being released either today or tomorrow (depending on where you live and when you read this), the world looks like it’s finally getting the Deadpool movie we’ve all wanted. To coincide with this, Jonas has recreated the, erm, lower half of the merc with a mouth. And if you need more Deadpool before watching Deadpool, may I present to you Deadpool as reviewed by Deadpool. Deadpool. 74louloute brings the noise on a Friday night with his tribute to Wade Winston Wilson, better known to nerds everywhere as the disfigured and mentally unstable mercenary called Deadpool. 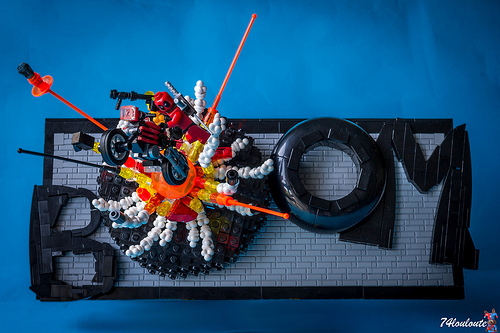 Almost lost in the epic explosion is one nifty little motorcycle design. BOOM!